FTP client software is used to connect to FTP servers to manage files on the remote computer. Some of the actions that can be performed using an FTP client are rename, delete, upload, download, move, change file/folder attributes, copy files from one FTP server to another using the FXP protocol, and create/remove directory. While most FTP client software does pretty much the same thing, each has its own distinct functionality. Most of the time you will find a site manager which acts like an address book where you can save all the details of the FTP server such as the host/IP, username, password, port and etc so you can easily connect to the FTP server by double clicking on an entry. You may also find another feature called “quick connect” that allows you to quickly connect to a temporary FTP server without creating another entry in site manager. The quick connect is normally a bar that is located somewhere at the top of the user interface that is close to the menu bar for quick access. Although the quick connect bar provides a convenient way to temporarily connect to an FTP server, some FTP clients automatically save the FTP login details which are quite visible when the program is running, not easy to remove and unsafe because the FTP server password can be easily harvested by a password recovery software. Here we show you the steps on how to remove the saved FTP login details in the quick bar for FTP client programs that have this feature. CuteFTP is a popular FTP client software by Globalscape that has been around since 1996. The quick connect automatically saves the FTP login details regardless of whether it is valid or not. At least the saved FTP accounts in quick connect are hidden and the user needs to click on the drop down menu to select the available FTP servers to connect to it. There is no way to manually and selectively delete a single FTP login details from the quick bar. The only way to clear it is by going Global Options from the Tools menu, or alternatively press Alt+F7, go to Security and tick the “Remove Quick Connect & Connect to URL history upon program exit“. 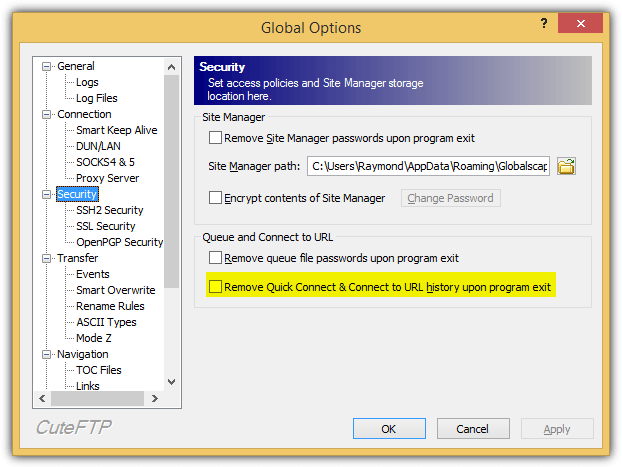 The quick connect FTP login details are saved in an encrypted binary value name QCHistory at HKEY_CURRENT_USER\Software\Globalscape\CuteFTP 9\QCToolbar\. Deleting the binary registry value will also remove the quick connect history. FileZilla is probably the most famous FTP client software because it is free and open source. It also has a quickconnect bar located below the icon toolbar. The host, username, password and port is automatically saved once you attempt to connect to it from the quickconnect bar. To removed the saved FTP login details from the quickconnect bar, click at the drop down menu and select “Clear history” which will remove every saved detail from the quickconnect bar. 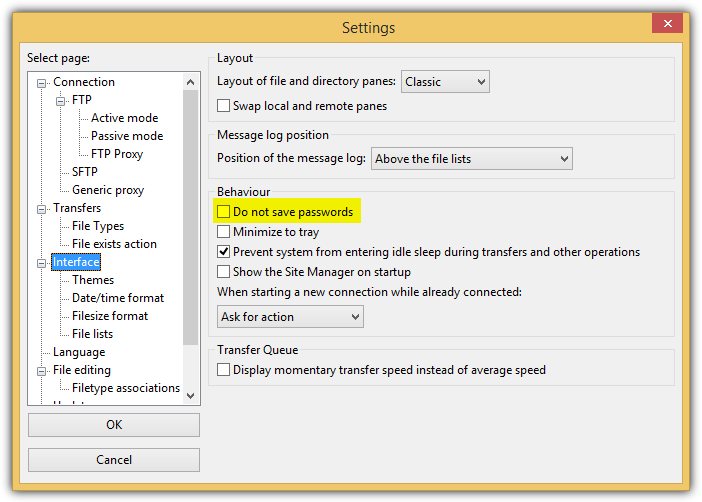 It is possible to configure FileZilla to save all the FTP login details except the password so that you can manually key in the password each time you connect to an FTP server from the quickconnect bar. Go to Edit > Settings > Interface > tick “Do not save passwords“. The password saved in the quickconnect bar is encoded in base64 and stored in a file called recentservers.xml in %appdata%\FileZilla\. FTP Voyager is the client version of the popular Serv-U FTP server. It used to be a shareware and is now released as a freeware after SolarWinds acquired the company at the end of 2012. You can find a quick connect feature in the Browser tab of the ribbon menu. Any information such as hostname, URL, login ID, password and port that you enter in the quick connect will be automatically saved. There is no button to clear the history for quick connect nor an option to disable saving of password. The only possible way to clear the FTP login details saved in quick connect is to just clear the data and closing the program will save the last state. The login details are saved in an external FTPVoyagerSettings.archive file located at %AppData%\RhinoSoft\FTP Voyager\. FTP Rush is another free FTP client software that was last updated in 2011. The graphical user interface has an outdated Office 2003 look and feel but can be changed from Options. Just like any other FTP clients with quick connect, it saves the host, port, user and pass without checking for validity. The only way to remove the saved quick connect details is from the Site Manager which can be launched by pressing F3 key, or from the Tools menu bar and select Site Manager. Expand Quick Connect, select the FTP server that you want to remove and click the Delete icon from the toolbar. The quick connect FTP login details are saved in a RushSite.xml file located at %AppData%\FTPRush\. CrossFTP auto saves the temporary FTP server login credentials when entered in the Quick Connect bar but the good thing is it doesn’t load any of the saved details in the quick connect bar. You will need to click on the arrow pointing downwards icon, go to Quick History and select the saved profile. Clearing the quick history records can only be done from the Site Manager which can be accessed by pressing F9 or from the Sites menubar > Site Manager. Expand Quick History, right click on the site that you want to remove and select Delete. BulletProof FTP Client is shareware and the development seems to have been halted because the last version was released back in 2010. Apart from that, the graphical user interface looks a bit dated in comparison with today’s modern applications. The quick connect bar auto saves whatever information that is entered in the box. To remove it, simply delete all the information and closing the program will overwrite the old login info with the new one. The automatically saved FTP login details from the quick connect bar are stored in an external file called Default.bps at %LocalAppData%\BulletProof Software\BulletProof FTP Client\2010\. Only the password is encrypted while other details are stored in clear text. TurboFTP is one of the few FTP clients that has an obvious button to easily remove the saved FTP login credentials in quick connect bar. As you can see from the screenshot above, all you need to do is click on the X icon at the far right end of the quick connect bar. Additional Notes: Xftp also has a quick connect bar and it only saves the host name or IP address but not the user name and password. You can also find a small Quick Connect box in Cyberduck but the login details are never being automatically saved. As for WinSCP, FlashFXP, Core FTP LE and 3D-FTP, they all don’t have a quick connect bar. Really very very helpful !!!!!!!!!!!! This is a very important aspect for using any FTP software. Leaving your login info in the history of such a program puts what ever sites you may have on there at risk of being tampered with.